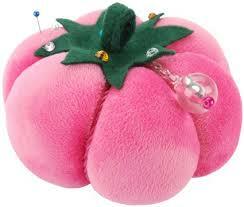 Recently I was browsing on the internet and I ran across this article about the Tomato Pincushion. I learned something I didn't know. So then I researched a few more sites to make sure I wasn't just reading some made up, feel good story. Turns out I think they're right. 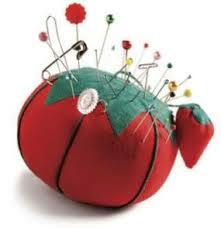 Martha Stewart Living reports "The first-ever documented mention of a generic pincushion dates back to the Middle Ages. Of course, in those days, they were more whimsically called "pimpilowes," "pyn pillows," and "pin-poppets." The pincushion was invented as a practical aid for storing pins and needles, but it also showcased one's collection of pins and needles. (Needles were costly, after all.) But the less-iconic shapes of dolls, birds, and prettily-packaged boxes left something to be desired." Then the time honored Tomato Pincushion came to be. It seems according to Wikipedia "One popular design—a tomato with a strawberry attached—was most likely introduced during the Victorian Era. According to folklore, placing a tomato on the mantel of a new house guaranteed prosperity and repelled evil spirits. If tomatoes were out of season, families improvised by using a round ball of red fabric filled with sand or sawdust. The good-luck symbol also served a practical purpose—a place to store pins. Typically, the tomato is filled with wool roving to prevent rust, and the strawberry is filled with an abrasive to clean and sharpen the pins." So there you have it. If Wikipedia says it to be so then it must be true... right??? Do you have a tomato pin cushion? ... or maybe two or three? I have one or two that are the traditional tomato pin cushion, you know red in color... And then I have one like this one. It's my favorite! My friend Donna gave it to me several years ago. Of course it's pink for the the Quilting Queen! Of course, if you're like me and you don't do that dirty "H" word unless it's absolutely necessary, then generally just any ole needle will work. I do have some favorites though but I'm not a needle snob. I probably would be if I did more of the "H" word. 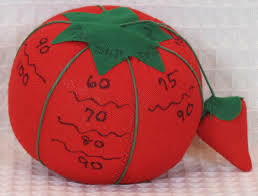 Even so, I've made one of my tomato pincushions with labels to put my needles in it. Such a neat post! I learned something new today!